This blog was written by Shawn Van Decker, PTA, CPT. Many athletes have been injured at some point during their athletic career. It’s just a part of playing sports. 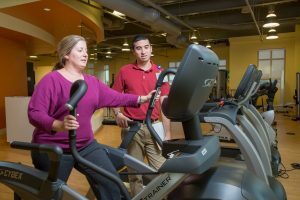 From ankle sprains to injuries that require surgery, no injury is too small to benefit from physical therapy. Yes, your ankle sprain will feel better with rest and you will be able to return to the sport. However, the likelihood of re-injuring the ankle goes up without intervention. This is partially because the affected body part loses proprioception, a specialized variation of the sensory modality of touch that encompasses the sensation of joint movement (kinesthesia) and joint position (joint position sense) (Lephart, Pincivero, Giraido and Fu, 1997). This is also due to the nature of the injury to the tendons and muscles. I believe that most injuries occur because the body is out of balance due to weakness or lacking appropriate proprioception. If you consistently put stress on a portion of your body more than normal, there will be a time it won’t be able to withstand it anymore and that is when injuries occur. In physical therapy, we work on the acute stage of the rehab, such as gaining range of motion and strength. What people don’t realize is that the return to sport phase is just as important. At Bon Secours Physical Therapy, we work on getting your body working together as a unit with different neuromuscular re-education exercises that help translate to game-like movements. The purpose of these specific exercises is to help the athlete get the right and left side of the body to communicate together to work in-sync. Many studies have shown the importance of proprioceptive training and the positive effect it has on our body, including a decreased risk of injury. Proprioceptive deficits in the body’s core may contribute to decreased active neuromuscular control of the lower extremity, which may lead to valgus angulation and increased strain on the ligaments of the knee (Zazulak, Hewett, Reeves, Goldberg, Cholewicki, 2007). The more I treat athletes, the more I discover that athletes between the ages of 12-16 have the most proprioceptive deficit. The reason behind that is that these athletes are hitting their growth spurts between these ages. An increase in growth at more than normal speeds brings some in-coordination. Think of it like a puppy with big feet. They are really clumsy until they fill out. It’s the same with our young athletes. Even with the in-coordination, we can help these young athletes become more proprioceptive aware and create an environment where they can learn and work on getting back to or even better on the field or court. Don’t ever think an injury is too small to benefit from physical therapy. It just might be the difference in your staying on the field for good or creating another injury.